Individual and tailormade arrangements are available on request. From early on, the silk roads functioned as a link between the East and the West on which both material goods and knowledge were exchanged. The cultural impact of the old trade routes was immense. Many of the ancient caravans which followed the silk roads either started or ended in the heart of the middle Kingdom – and so does our journey. From Xi’an, home of the terracotta warriors, we travel by train to to the legendary Oasis of Dunhuang. There we hop on our bicycles and follow the Northern Silk Roads leading us westwards along the edge of Taklamakan desert. Our two weeks of cycling through the beautiful roughness of steppe, stone- and sand- desert and oases ends in the multicultural city of Turpan. A visit to Beijing, Chinas political and cultural capital will round up our journey. Note: Individual and tailormade arrangements for this tour are available on request. Individual arrival in Xi'an. Transfer to the Hotel and first stroll through the alleys of the old town. In the evening we have our first encounter with the delicious Chinese cuisine. Towards the end of the first millennium Chang'an (now known as Xi'an) used to be one of the world's most populous and cosmopolitan cities. Exploring the muslim quarter with its cultural relics, the old mosque and tasting some of the local specialties from uigur food stalls, we can still feel the vibe of the city's multicultural past. Today we visit the world famous terracotta grave guards of Qin Shihuang, China's first emperor. In the afternoon, we cycle leisurely on top of Xi'an's historic city wall. fter giving everyone time for relaxation and individual exploration in the morning, we board a train which takes us westwards in the afternoon. Along the edge of the Gobi the train follows the Hexi corridor and heads towards the oasis of Dunhuang. We arrive in Dunhuang in the morning. The city used to be an important junction of the silk roads from which separate routes South and North around the Taklamakan desert departed. We set out to gather first impressions of the life and culture in China's far West and visit the “Singing Dunes” outside the city in the evening. Buddhist art is the theme of the day! We take our time to explore Dunuang's beautiful and unique Buddhist sculptures and murals. In the morning we take the train to Xinjiang province and the city of Hami, where we receive and prepare our bicycles for a first relaxed ride. As the city is famous for its sweet 'Hami-Melons', our first destination will be the melon market at the outskirts of town. Today we visit the tombs of Hami's Uighur Kings who ruled the area until 1936. Walking over oriental bazaars we can still sense the Uighur influence on today's Hami. On a challenging route we cross the foot of the Tianshan mountain range to reach the grasslands of the Northern Silk Road. On an altitude of 2,000 m we spend one night in Kazakh yurts. Mainly descending, we cycle through landscape which is populated and shaped both by central Asian nomads and Chinese farmers. In the early afternoon we reach Barkul, which used to be a garrison town at the silk road. For the next four days we stay on the Northern Silk Roads, riding through areas dominated by Kazakh settlers. We pass Xiaolaba, Mori, Jimsar and reach Fukang on day 14. Stretched out on an average altitude of 1,500 m, this trade route used to be a popular alternative to the Southern routes during the hot summer months. We take a bus to reach the Lake of Heaven (Tianchi) at an altitude of 2,000 m and set out to explore its surrounding by foot. The lake, subject to many stories and myths lies right within the Tianshan mountain range in an area populated by Kazakh nomads. Return to Fukang in the afternoon. 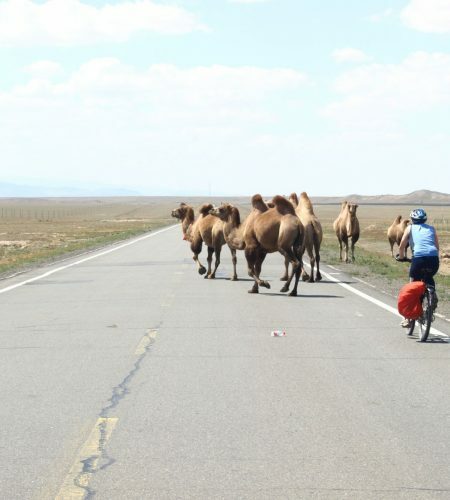 Today we cycle to Urumqi, the metropolis of the Chinese Wild West. We have the whole day to explore Urumqi, the capital of the Autonomous Region Xinjiang . The multicultural atmosphere of the city is shaped by Uighur, Arab and Chinese cultural heritage. The city's bazaars are well-known for their abundance and diversity of goods. For the first and last part oft today's trip, we ride in our support bus. However, for the long and magnificent descent into the Turpan-Basin we hop on our bikes gain. On the way we pass China's largest wind energy park at Dabanchang. Located at the edge of the Taklamakan desert, Turpan's secret to its rich and fertile grounds is based on the “Karez” - an ingenious underground watering system. We have two days to explore Turpan's many attractions such as the Karez museum, the ruins of the Han dynasty garrison town of Jiaohe, the famous Emin minaret and the flaming mountain. After a bus ride back to Urumqi we take the plane for a direct flight to Beijing. A two-day stay in Beijing, the main site of China's more current history, will round up our journey. Over the course of the day, we visit the Temple of Heaven, go for a stroll over Tian'anmen square and explore the countless rooms and courtyards inside the Forbidden City. “Who never climbed the Great Wall cannot be deemed a man” says a Chinese proverb. Indeed, once in Beijing, one should not miss the opportunity to visit one of the world's most magnificent buildings. On an optional day trip we climb the “wild wall” North of Beijing at Huanghua. This section of the wall lies beautifully above a water reservoir and is still spared from tourist sell-out. Transfer to the airport and individual return Journey.